Classics Today 10/10; Music Web International: outstanding; Gramophone: outstanding; Penguin Guide 3 stars. In 1935 Herbert Howells’ son died at the age of nine. Howells sought release and consolation in his writing, and composed the a cappella six-movement Requiem as a private document to his son. 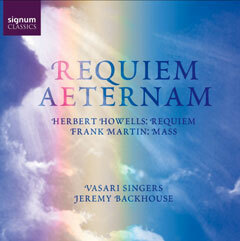 Indeed, Howells considered his Requiem so personal an outpouring that he felt the need to withhold it from publication. It was not released until 1980, only three years before the composer ’s own death. The motet Take him, earth, for cherishing has the dedication "To the honoured memory of John Fitzgerald Kennedy, President of the United States of America", and was composed for the commemoration in Washington on 6th June 1964. Frank Martin was a deeply religious man. He composed the Mass for Double Choir, early in his career. The work embodies the profound nature of his beliefs, and was the only work that Martin wrote purely for liturgical purposes. Such was the intensely intimate nature of the work, that, like Howells, the composer withheld it, and kept the manuscript safely in a drawer for over forty years. As Martin himself wrote, "This was something between God and me, that concerned nobody else".